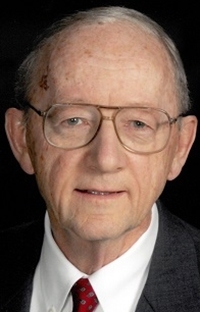 Kenneth Myers, a longtime Beaumont Hospital administrator and leader, died Friday at 86, according to an obituary through McCabe Funeral Home. Myers started his career with the Burroughs Corp. in Detroit. In 1966, he made his way to William Beaumont Hospital in Royal Oak, Mich., where he began as controller and ended his career 30 years later as CEO. At the time Beaumont had hospitals in Royal Oak and Troy, Mich. It has since grown into Beaumont Health, an eight-hospital health system based in Southfield. Myers also served as chairman of the the Michigan Hospital Association's board and executive committee and was a member of the Beaumont Hospital board of trustees. He also served on the board of other organizations including the Salvation Army, William Tyndale College and Laban Ministries in the Congo, according to his obituary. Gene Michalski, a retired CEO of Beaumont, described Myers as his former mentor, a "guider of the people" and a devout Christian. "As a mentor he behaved like you would want a leader to behave," Michalski told Crain's. "It's like raising your children — you teach them values by living the values you want them to learn." The University of Michigan graduate grew up in Battle Creek and was an Army veteran, according to the obituary. "Never critical or unforgiving, he only knew how to truly encourage the people who surrounded him," the obituary said. "He was a born leader and inspired countless people throughout his lifetime." Myers is survived by his wife, Nancy; daughters Cynthia, Anne and Sue; son Tom; sister Janeis Yunt; and nine grandchildren. Visitation is scheduled for 2-8 p.m. Thursday and 10-11 a.m. Friday at McCabe Funeral Home in Farmington Hills, Mich. The funeral service is 11 a.m. Friday at Brightmoor Christian Church in Novi, Mich.
Memorial donations can be made to Beaumont Health Foundation. — Anisa Jibrell contributed to this report. "Kenneth Myers, former CEO who served Beaumont for 30 years, dies at 86" originally appeared in Crain's Detroit Business.